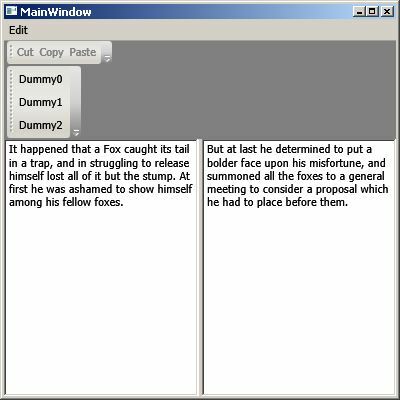 Let’s start with a program that uses Cut, Copy and Paste in two TextBoxes without writing any C# code. This is not a typo. We only need XAML for this. I added a Toolbar with some dummy labels just to keep the learning curve going. You remove them without any risk. Some input controls handle command events on their own. Everything is built-in already. All you need to do is to provide the Buttons or MenuItems which call these commands. The elements even enable/disable themselves. 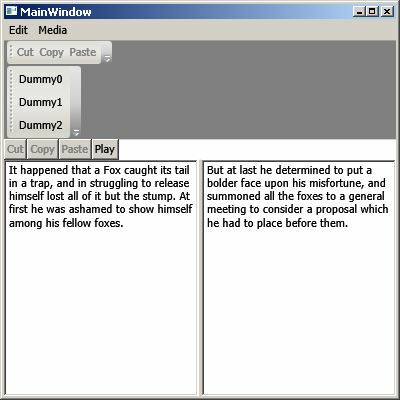 We have two textboxes in the example. These commands are applied to the element that has the focus. How can this be achieved? The element finds the window instance and then determines what element was focused previously. This only works for Toolbars and Menus UNLESS you set the CommandTarget property manually. Let’s add standard buttons now. You cannot see any effect when you press them. The buttons are even ghosted. To solve this we assign the names TextBox1 and TextBox2 and link the Button CommandTargets to these elements. 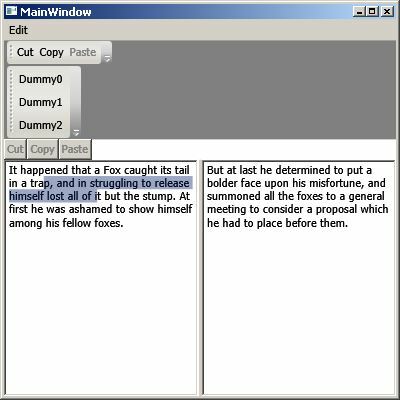 You can now cut or copy from TextBox1 and paste it into TextBox2. But hardcoding is a really bad approach. Therefore we are going to use FocusManager.IsFocusScope=”True” instead. WPF then checks the parent focus. 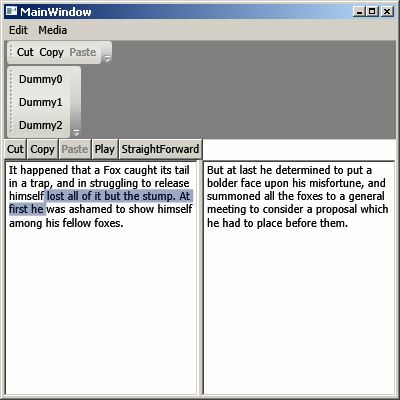 By default, the Window class is a focus scope as are the Menu, ContextMenu, and ToolBar classes. The following example is flawless. The IsFocusScope approach has the advantage that the same commands apply to several controls. We are going to write our own commands now. For this we need to create a class and add a property that returns a RoutedUICommand instance. This property needs to be static. And to initialize this class you also need a static constructor. The MainWindow class should look like this. The method CommandBinding_PlaySound_Executed plays the system beep sound. Add the class in your XAML namespace. I used xmlns:c=”clr-namespace:CustomCommands” . There is a shortcut to calling commands. You can create an ICommand instance and provide it via a property. The downside – what did you expect? – is that you have no shortcut key or any other comfort. Step 1: Create a class that inherits from interface ICommand. Step 2: instantiate that class and provide it via a property. You do not need to expose the class in your MainWindow. You can use any class. Set the DataContext to your class where the property is (or use a precise path that leads to that object). Step 3: Bind the command in XAML. Posted on April 15, 2014, in Advanced, Basic, C#, DataBinding, WPF and tagged advanced, C#, C-sharp, Command, ICommand, Interface, programming, RoutedCommand, RoutedUICommand, Source code, WPF. Bookmark the permalink. Leave a comment.